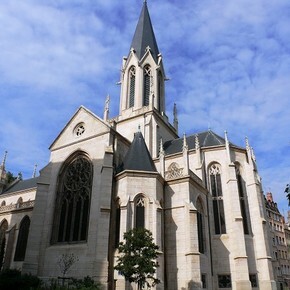 This district, built between Fourvière hill and the river Saône, has lost none of the charms to be found within its narrow Renaissance alleyways. Step back in time to a day and age when Lyon was a well-known trade fair town and suppliers from all over Europe flocked here to exchange their wares. Its 15th and 16th century buildings have housed wealthy families of bankers, as well as Italian, German and Flemish merchants. Vieux-Lyon is a secret and mysterious district, revealing itself mainly behind closed door, where hidden passageways or traboules enabled people to pass discreetly from one street to another without leaving the building. Nowadays, the inner courtyards reveal the great wealth of their former owners. Although the façades of the buildings may appear plain from the outside, visitors are astounded when they dare to peep behind closed doors! Rue Saint-Jean, close to the gothic Saint Jean Cathedral, is home to numerous restaurants and stores. And in Rue du Bœuf, designer boutiques vie for attention with Michelin starred restaurants listed in the famous French guide. Don't hesitate to wander off and lose yourself among the neighbourhood's narrow cobbled streets!